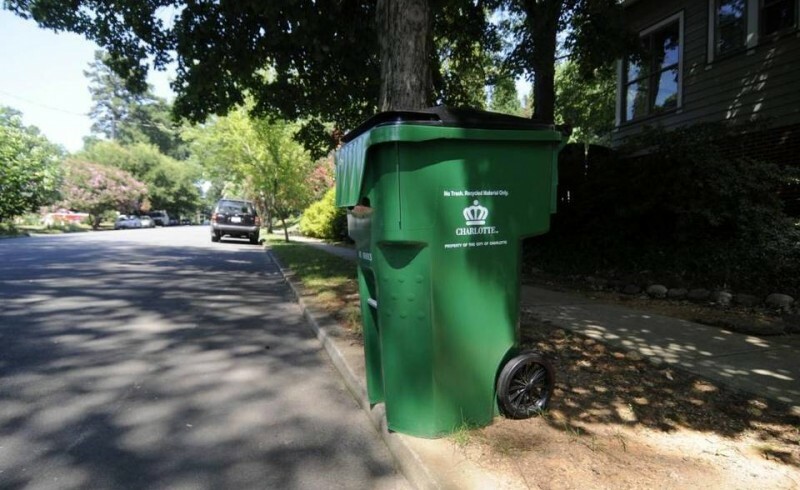 The City of Charlotte announced a significant change in recycling bin rules last week, but there have been some problems with the rollout. The change: Beginning immediately, all cardboard must be torn into pieces no larger than 18×18 inches before being put into curbside recycling bins. Also, cardboard should not be folded. The problem: Other than a few Twitter messages and a Christmas day Facebook post, the city hasn’t appeared to have made much effort to get the message out. Judging by our non-scientific peek at recycling bins around Charlotte this week, few residents seem to have gotten the memo about the 18-inch mandate. Some who did aren’t happy. “Ridiculous!” said one response to the city’s Dec. 22 tweet. “You are making it onerous to comply,” another objected. The city says that the new cardboard requirements were put in place so that larger and folded pieces of cardboard don’t block other items. “The change is to ensure that all bins are emptied during the collection,” the city’s social media account explained. We admit to some similar skepticism when we first saw the new cardboard rule. If you want to encourage recycling, as Charlotte seems to, it might not be a good idea to make recycling harder. Such is the tug that cities sometimes face with waste disposal. Beyond the obvious environmental benefits of reducing greenhouse gas emissions, recycling theoretically saves money by reducing trash volume and landfill costs. There’s also some branding benefits – cities with robust and successful recycling programs are seen as progressive by environmentally conscious workers and businesses. All of which has prompted a handful of U.S. cities – including Seattle, San Francisco and Boulder – to declare a goal of becoming “zero waste communities” that generate new materials from most or all of their waste. Other cities, although less aspirational, have tried to encourage recycling by making it easier, primarily through “single-stream” programs that allow residents and businesses to put all recycling items in one bin instead of having to sort. But collecting, transporting and sorting items costs money, and cities are perpetually on the lookout for resource-saving efficiencies. Some wield more of a stick than a carrot – most notably New York City, which not only fines residents who don’t recycle, but requires them to sort and separate paper and cardboard goods from metals, plastics and glass. It’s unclear if and how Charlotte plans to enforce the new cardboard requirements. City officials were unavailable for comment Wednesday. While we appreciate the city’s attempt to efficiently empty recycling bins, officials should revisit the new requirements. An 18-inch mandate might be burdensome to some residents, especially the elderly. A possible compromise: Many cities, including those with progressive recycling programs, allow to residents put larger cardboard pieces next to recycling bins. Doing so solves the bin blockage problem without deterring people from the city’s larger recycling goal – reducing waste, not participation.